“With this certification Accelerated continues its investment within the Verizon cellular network to satisfy surging customer demand”, said Gretsch. The Verizon cellular network is secure, but once data enters the public Internet, it is at risk of being seen or altered by unauthorized parties. The Verizon Wireless Private Network gives businesses a segregated private network for connecting their mobile devices with private data kept separate from public traffic via a direct connection to a company’s internal network. This capability allows a company to completely control access to and from this private network. The 6300-CX is a low-cost, enterprise grade business continuity solution that provides failover connectivity to core network connections such as cable, DSL or fiber. The 6300-CX delivers instant wireless connectivity as a primary connection or as a failover pass-through connection over the Verizon network for any Ethernet enabled device. It is significantly smaller and more affordable than other enterprise cellular routers and can cost significantly less to operate than redundant cable or other connections. Accelerated’s 6300-CX is Verizon Private Network ready now. Accelerated is an innovator and leading designer of VPN, Cellular and OEM solutions specializing in global cellular data network communications. Its industry-leading hardware and software solutions provide primary and failover fixed wireless data connectivity for business continuity and cloud-based network management. Since the creation of its flagship NetBridge product in 2006, Accelerated continues to innovate its line of cellular hardware, network management software and network function virtualization (NFV) technology. 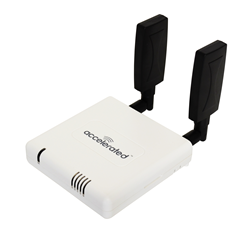 Accelerated offers a range of wireless WAN (WWAN) products including the 6300-CX and 6300-LX series of LTE, 4G and 3G router products ideal for retail or branch locations or even Machine to Machine (M2M) and Internet of Things (IoT) environments. More advanced communication technologies such as its 5301-DC Dial-to-IP™ Converter and its 5400-RM Cellular Out-of-band (OOB) Remote Manager, a compact, high-performance, remote network management platform complement its product line. All Accelerated products can be centrally managed using the Accelerated View™ cloud-based network management software. Accelerated is headquartered in Tampa, Florida, with offices in Chicago, Atlanta and Brisbane, Australia. For more information, visit: Accelerated.com.